This is a well made box worth the cost. This is the third time I have replaced this box over many years of service . Glad I searched the internet to find you, my source here in west Tennessee doesn't carry them anymore and we need to match for our neighborhood. What a Quality Made USA Product. Fulton has NOT forgotton how to do things right. 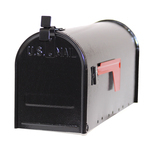 What a pleasure to be able to purchase a mailbox that is NOT plastic and has a flap hook and clasp that is lockable. I am impressed and that is NOT eaisly done, believe me!! After an exhausting search for a replacement mailbox I found Fulton online. This box now proudly sits atop my existing mail post in the honored spot once occupied by a senior 40+ recepticle. Easy to install, tight sealing, non-leaking, bright and shiny. We're the envy of the neighborhood. Thank you Fulton for providing the exact model we needed for a reasonable price. This was a five star transaction. Long time and high volume user. Headline says it all. I will continue as stated above.